At noon EDT today, April 17, sales kick off for the annual proof set of silver coins from the U.S. Mint facility at San Francisco. 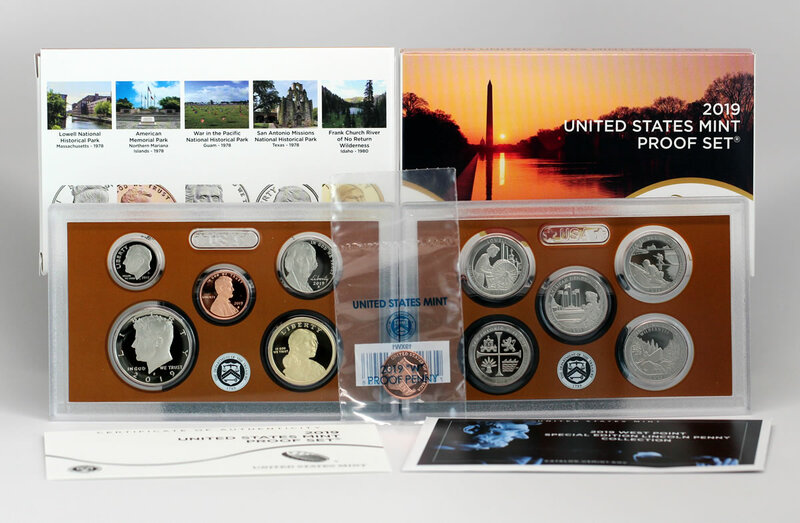 In a twist from past issues that adds excitement, this year’s set includes coinage with greater silver purity and a bonus "premium coin." For the first time ever, the set’s silver coins are produced in 99.9% silver instead of 90% silver. And, the set comes with an additional special edition 2019 Lincoln cent. In contrast to the set’s ten coins with their proof finish and San Francisco "S" mint mark, the added cent has a reverse proof finish and carries a "W" mint mark designating its production at the West Point Mint. It is the second of three special "W" cents for release in 2019. Three of the coins have traditional clad compositions, as does the premium reverse proof cent. The other seven coins weigh a combined 6.937 grams, which equates to about 1.51 troy ounces of silver. 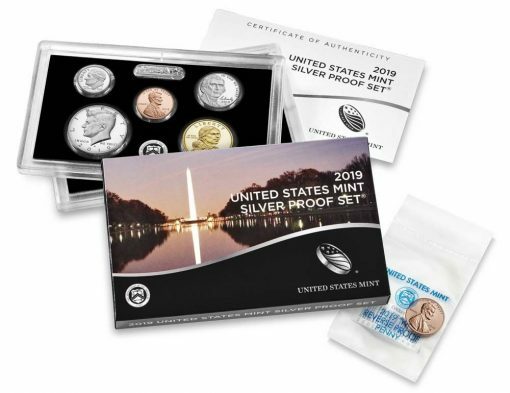 The silver coins differentiate this product from the Mint’s clad 2019 Proof Set which launched last month and included its own special edition 2019-W Lincoln cent. A CoinNews photo of a clad 2019 Proof Set for $27.95. This standard, non-silver set from the San Francisco Mint was released March 1. A premium 2019-W Proof Lincoln cent, shown center, comeswith each purchase. Aside from the composition differences (and different premium cent), these same coins are in the 2019 Silver Proof Set. The silver set’s ten coins are held in two protective lenses, like past sets. The premium "W" cent comes packaged separately in clear United States Mint plastic wrap, but the only way to get one is by buying the set. This CoinNews photo shows five 2019-dated quarters. 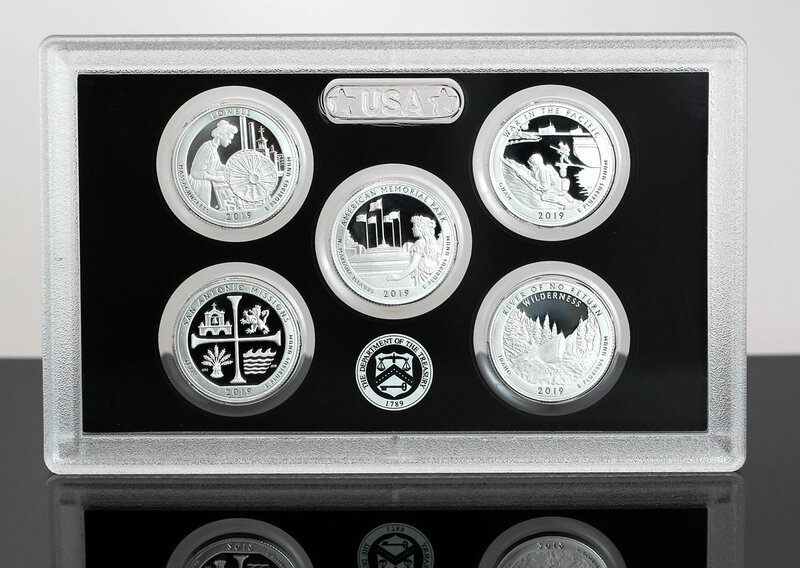 These are silver editions released earlier in the separate U.S. Mint 2019 America the Beautiful Quarters Silver Proof Set™, which is available for $36.95. These same quarters are in the more encompassing 2019 Silver Proof Set that launches today. Designs exclusive to 2019 include the Mint’s five America the Beautiful Quarters®, shown above, and the Native American dollar, shown below. 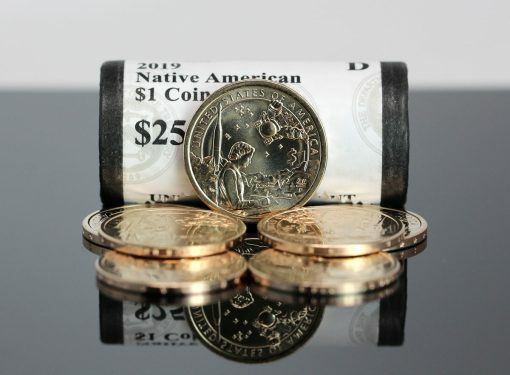 This CoinNews photo shows 2019 Native American $1 Coins. The U.S. Mint began selling rolls and bags of circulating-quality dollars on Feb. 13. A higher quality proof version of the dollar is included in the 2019 Silver Proof Set. The dollar’s design honors American Indians in the U.S. Space Program, featuring Mary Golda Ross writing calculations. Regular coins for circulation are made at the Philadelphia and Denver Mints. Proof coins from the San Francisco Mint are produced with extra care, featuring frosted designs set against mirror-like backgrounds. They are struck multiple times resulting in an increased level of detail using polished dies and hand-polished blanks. The West Point Mint’s reverse proof cent is essentially made like a standard proof coin but its appearance is opposite, featuring mirror-like designs against frosted backgrounds. The 2019 Silver Proof Sets may be ordered from the Mint’s website page dedicated to proof sets, located here, or by calling 1-800-USA-MINT (872-6468). No mintage, household or product limits are in place. I hope the “W” penny sky rockets in value to $55…lol Then this set might be worth the purchase. Will be interesting to see the total mintage of this special coin. certified examples could shoot to the moon IF conditions are right. We don’t need a special penny – we need to get rid of the penny altogether!!! What’s wrong with these people??? The one cent coin is beautiful and an asset! You must be out of your mind to want a dissolvement of one of the most recognizable coin in us history! Put the method pipe down and join us back on earth! Practically, Canada has gotten rid of their penny and England replaced their 1 and 2 pound notes with coins. We’re still making millions of pennies that cost more to make than they’re worth. I’m not too happy about the mint abandoning the traditional silver composition in this set in favor of .999. Just wondering what others on this board think? What I would like to see next year in the silver proof set would be all silver coins including the penny, the nickel and the dollar. Maybe if the Mint limited inclusion of the W penny to the first 50 or 100k sets sold…. I like the .999 silver and special penny! As to getting rid of any of our coinage, be careful what you wish for. Scandinavian countries are already getting rid of cash transactions by accepting only electronic payments! Never let our hobby suffer this fate! Problem is new generation are pay more attention on their cyber world ! And coin and stamp non their minds are speculation for profits not really hobbyist. Our stamps and coin collection are dying .